When searching for a skilled permanent makeup and microblading artist, you can be swallowed by seemingly endless choices. You want an artist with many years of experience. The artist, who has enough credentials such as certifications, licenses, an extensive portfolio, and real clients reviews. They should have their own unique techniques and high expertise. The artist needs to understand the bone structure of the face to properly design your eyebrows. The artist's office should be professional looking and have high standards of hygiene. Booking a consultation is highly recommended to help build your confidence in the artist. Milla Rosen meets all of the above criteria and more. People come from all over the country and even over seas to get their permanent makeup done by Milla. Born in the USSR, Milla received a Master's Degree in electrical engineering. After working as an engineer for 10 years in Atlanta, she decided to finally fulfill her life’s dream and pursue a profession in the beauty industry. She had the amazing opportunity of working as a makeup artist with big name makeup line such as Trish McEvoy. Then, she obtained her esthetician license and started a career as a skincare specialist. Milla was always good at drawing as well as a big lover of art so, she decided to try herself in permanent makeup and took her first class nearly 20 years ago. To this day, she continues to polish her skills by taking many different courses and trainings all over the world from the best in the industry. Her experience as an esthetician and makeup artist has given her unique knowledge about both skin and facial bone structure. Her engineering skills helps her create perfect and natural looking eyebrows, according to the face features of each individual client. All her previous careers and skills helped her to become the world renowned master in permanent makeup she is today. Having worked successfully doing permanent makeup for almost twenty years, Milla has incredible experience and expertise when it comes to both advising and performing quality work. Her unique skillset, talent, and experience separates her from the competition. Now an educator and business owner, Milla loves what she does more than ever. She can make any client feel like a friend. Former clients have remarked on the comfortable and relaxed nature of her appointments and the near painlessness of the procedure. When Milla does your service, you can be sure that you'll love the result. Milla is a AAM board certified permanent makeup artist and educator. She has expertise in many different forms of permanent makeup such as permanent eyebrows, eyeliner, lips, advance procedures include scar camouflage, areola re-pigmentation and scalp micropigmentation. Her work bringing back confidence to many men and women with hair loss. Exceptional results of her work have made her one of the most requested technicians. She is head of Scalp Masters Atlanta. Her eyebrows with 3D hair strokes technique offers the most natural looking effect. For lips, she can enhance shape and fullness by using different techniques such as: full lipstick or ombré lip liner look. The micropigmentation also allows her to fill in areas of skin that are discolored. The desired result of eyeliner can be achieved accordingly to the client's request. The designs range from a very subtle look with eyelash enchantment to dramatic cat eyes. Some clients, however, may be searching for corrective cosmetic services. Milla has been referred by dermatologists for her work and is proud to offer scar camouflage and reconstructive micropigmentation. These services often benefit those seeking even skin tones following facelifts and breast reconstruction or augmentation. While all of her experience shows she has the knowledge and ability to perform excellent work, it is her client reviews that truly do the talking. Milla has been described as "caring, compassionate, and empathetic." She has helped many clients with alopecia, some returning to her yearly from distances as far as California. She can boost your confidence in just one appointment by creating symmetrical eyebrows, fuller lips, or enhance the beauty of your eyes. Milla holds the experience, licensing, and creativity to fulfill your permanent makeup or corrective cosmetic needs. She can liberate you from every day task of designing your look. Let a professional permanent makeup artist like Milla Rosen help you save time and money. Contact her today to set an appointment. What real client thinks about our Eyebrow Microblading. Best permanent makeup in Atlanta as seen in CBS 46 news! Best Female Artist 2016! SCALPA Best Procedure SMP Award 2016. 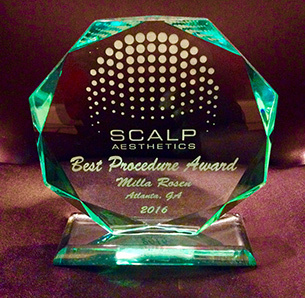 Best Procedure of the Year Scalp Aesthetics Award 2016! 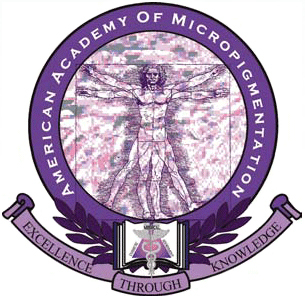 Member of the American Academy of Micropigmentation (AAM) for 15 years. Milla Rosen is an AAM board certified Permanent Makeup Artist and Educator, fully licensed esthetician and head of Scalp Masters Atlanta. + $100 for every additional session if needed. in order to reserve your consultation appointment.